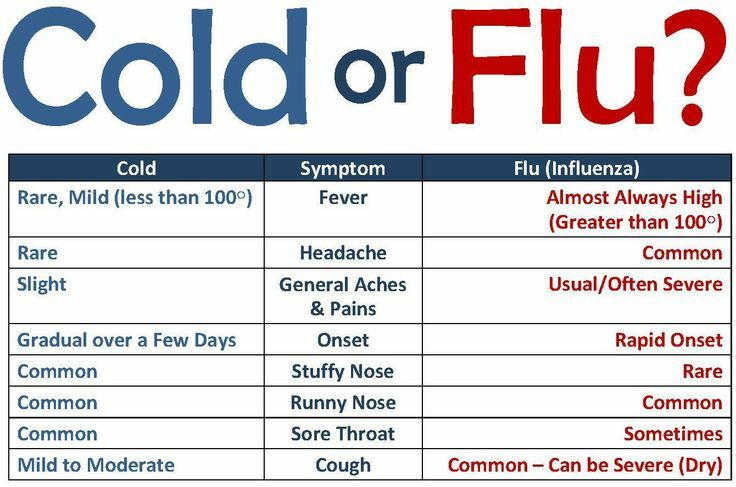 In many cases, you will have a challenging time differentiating between a flu and a cold because of the similarity in symptoms. Here’s how you can tell one from the other. Both the common cold and flu are respiratory infections but the viruses behind their onset are different. The common cold can be caused by any of over 200 viruses known to trigger it while the flu only has a handful of viruses behind it; the flu virus, however, can mutate resulting in different strains. In general, the flu has more intense symptoms than the common cold. The importance of differentiating between the two infections cannot be overemphasized since the flu is more likely to result in serious complications including pneumonia, which will require immediate and appropriate medical attention. In a common cold, a runny and stuffy nose coupled with sneezing, a scratchy throat, watery eyes, and mild fever are the typical symptoms. In a flu infection, the symptoms are more severe in comparison with the common cold. The symptoms include high fever (above 102⁰F), cough with phlegm, nausea, body aches, lack of appetite, and sweating. You will also be able to differentiate the two based on the speed of development of the symptoms. If your symptoms develop suddenly – without warning – then you likely have the flu since the common cold’s symptoms develop in a more gradual manner. You will usually not require an appointment with your doctor in both the common cold and flu infections. But you must do so when you have an underlying medical condition that increases your risks for complications (e.g., diabetes), or your symptoms are severe, or your symptoms indicate a serious infection than the common cold. Your symptoms can last for about 10 days in both cases. While there’s no cure for the common cold, your doctor may prescribe an antiviral medication for flu to speed up recovery. Antiviral medications are the second line of defense with the first line being flu vaccines, such as those administered at Publix pharmacies. Whether you have a cold or a flu infection, you should get plenty of rest, drink plenty of water and fruit juices, and avoid smoking and alcohol, and taking over-the-counter medications like paracetamol to counteract your specific symptoms.